Ending all the speculation and rumors, Apple today announcedÂ iPhone 4S, iOS 5 & iCloud at its “Lets talk iPhone” event.Â iPhone 4S is said to beÂ the most amazing iPhone released till now packed with incredible new features including Appleâ€™s dual-core A5 chip for blazing fast performance and stunning graphics; an all new camera with advanced optics; full 1080p HD resolution video recording; and Siri, an intelligent assistant that helps you get things done just by asking.Â Appleâ€™s dual-core A5 chip is same chip that is being used in iPad 2.
iPhone 4S is powered by iOS 5 mobile operating system with over 200 new features including Notification Center, an innovative way to easily view and manage notifications in one place without interruption and iMessage, a new messaging service that lets you easily send text messages, photos and videos between all iOS 5 users. New iOS 5 features include built-in Twitter integration and iMessage to instantly share your photos via Twitter directly from the Photos app and send photos via iMessage to individuals or groups. With iCloud’s new Photo Stream service, a photo you take on your iPhone is sent to iCloud and automatically pushed to your iPad, iPod touch, Mac or PC. iOS 5 will be available as a free software updateÂ on October 12 via iTunes 10.5 for iPhone 4S, iPhone 4, iPhone 3GS, iPad 2, iPad and iPod touch (third and fourth generation) customers. Apart from iOS5 it comes withÂ iCloud, a set of free cloud services that work with your iPhone, iPad, iPod touch, Mac or PC to automatically and wirelessly store your content in iCloud and push it to all your devices. iCloud stores your music, photos, apps, contacts, calendars, documents and more, keeping them up to date across all your devices. When content changes on one device, all your other devices are updated automatically and wirelessly. iPhone 4S also introduces Siri, an intelligent assistant. Siri helps you make calls, send text messages or email, schedule meetings and reminders, make notes, search the Internet, find local businesses, get directions and more. You can also get answers, find facts and even perform complex calculations just by asking. Siri -Â Assistant will be available in beta on iPhone 4S in English (localized for US, UK and Australia), French and German. iPhone 4S includes an all new 8 megapixel camera with the most advanced opticsÂ with 60 percent more pixels. iPhone 4S includes a new custom lens, a larger f/2.4 aperture and an advanced hybrid IR filter that produce sharper, brighter and more accurate images. The Apple-designed image signal processor in the A5 dual-core chip is built for performance, and coupled with the features built into iOS 5, makes the camera one of the fastest on any phone. With iPhone 4S, the Camera app launches much faster and the shot to shot capability is twice as fast. 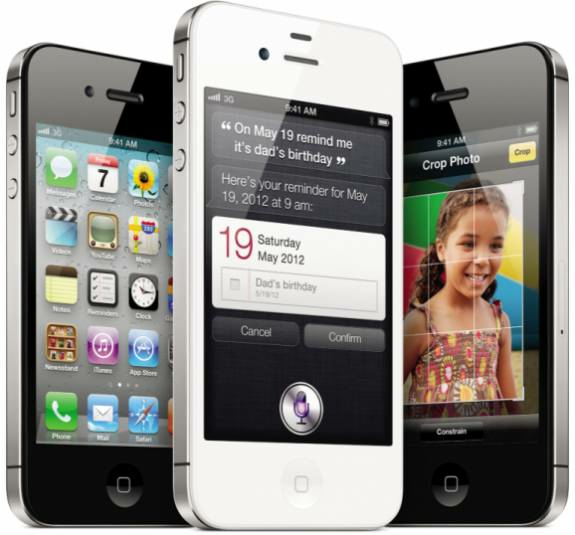 iPhone 4S comes in either black or white and will be available in the US with following suggested retail price. iPhone 4S will be available from the Apple Online Store, Appleâ€™s retail stores and through AT&T, Sprint, Verizon Wireless and select Apple Authorized Resellers. iPhone 4S will be available in the US, Australia, Canada, France, Germany, Japan and the UK on Friday, October 14 and can be pre-ordered beginning Friday, October 7.
iPhone 4 will also be available for just $99 (US) and iPhone 3GS will be available for free with a two year contract. iPhone 4S will roll out worldwide to 22 more countries by the end of October including Austria, Belgium, Czech Republic, Denmark, Estonia, Finland, Hungary, Ireland, Italy, Latvia, Liechtenstein, Lithuania, Luxembourg, Mexico, Netherlands, Norway, Singapore, Slovakia, Slovenia, Spain, Sweden and Switzerland. Unfortunately, the list doesn’t include India.